The number of people living into the triple digits (Centenarians) has increased 51% from 1990 to 2000, due in part to advances in health, education, and disease prevention and treatment. The average life expectancy has increased by a whopping 30 years during the 20th century — the greatest gain in 5000 years of human history. Research suggests that drinking freshly brewed loose leaf tea, whether green, black, or oolong, provides many health benefits from phytonutrient antioxidants. Scientists have identified high levels of catechin flavonoids in both green and black tea. These catechin flavonoids have anti-inflammatory, antioxidant and anticarcinogenic effects. Green tea, in particular, contains the catechin epigallocatechin gallate (EGCG), which may be the basis of green tea health benefits. Your daily habits may seem unimportant now, but they can influence how long and how well you will live. You only need one or two cups of freshly brewed tea daily to start on the road to becoming a member of the Centenarian club. 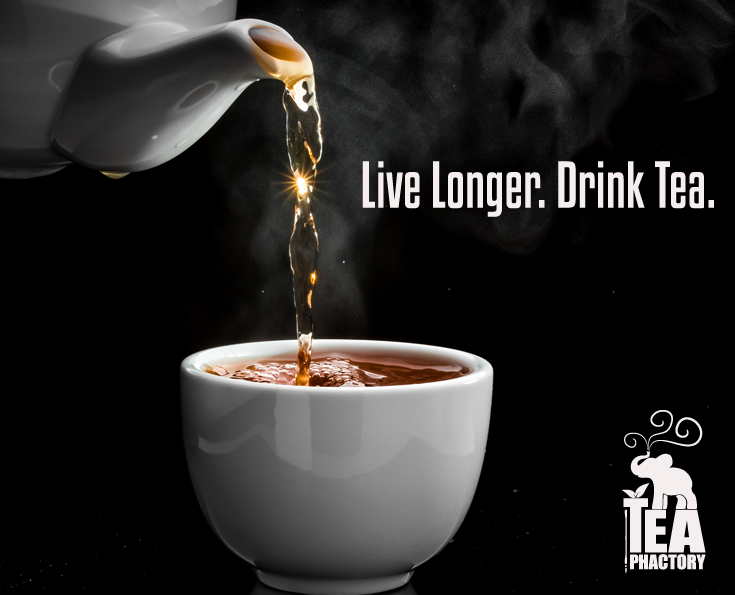 The Tea Advisory Panel, a group of scientists, doctors and nutritionists who study the health benefits of tea advise that consuming four cups of tea a day, whether green or black tea, can go a long way toward improving your health. Polyphenols found in tea are antimicrobial, meaning they reduce the effect of colds, flu and infections. As far back as the 1800’s tea was recommended to treat styes, and tea was prescribed to soldiers during the 1900’s to treat typhoid. Catechins (a form of antioxidant) found in tea are antibacterial, and have been found to remain in the mouth up to one hour after rinsing, helping to inhibit bacterial growth in the mouth for improved oral health. The catechins in green tea especially, may help to stop the absorption of fats and sugars in the body, and can help boost your metabolism. Drinking tea without milk and sugar provides a delicious zero-calorie beverage when watching your weight. L-theanine, an amino acid, works in conjunction with the caffeine in tea to calm you, and improve your mood and mental function at the same time. Tea improves your concentration, mental alertness and brain function. With such an endless choice in the variety and flavor of tea available today, everyone can enjoy the healthy benefits of drinking tea. At Tea Phactory we care about keeping your hand-selected, premium, loose leaf teas absolutely fresh. That’s why we pack every tea order in a food grade tin made of high-quality tinplated steel. This packaging keeps air and light away from your teas, ensuring the flavors are as bright and delicious the day you drink them as they were the day we packed them. Sure, we could use something less expensive like lined paper or plastic, but we care too much about our tea and your tea-drinking experience. There’s something else we care about, the environment. We understand that any type of packaging has some environmental impact. However, there’s one thing you can do with our tins that you can’t do with a paper or plastic bag – reuse them. Since our tins are food grade they are great for use in the kitchen. Refill them with herbs, spices, or baking mixes. Additionally, they are simply perfect for general kitchen organization. Get creative and use them to store craft supplies like buttons, safety pins, and beads. Or make a travel sewing kit with small scissors, thread, sewing needles, and a thimble. Have a green thumb? These tins are perfect for growing succulents, fresh herbs, or catnip. Place them on a windowsill for a mini container garden. 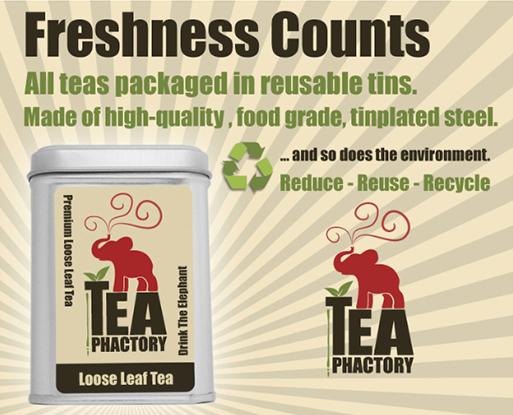 Whatever you use your empty Tea Phactory tin for it’s a perfect way to get imaginative and reduce waste. It’s our little added value to you and the environment. Iced tea season is somehow coming to an end, even though it’s still hovering around 100 degrees in Tea Phactory’s little corner of the world. 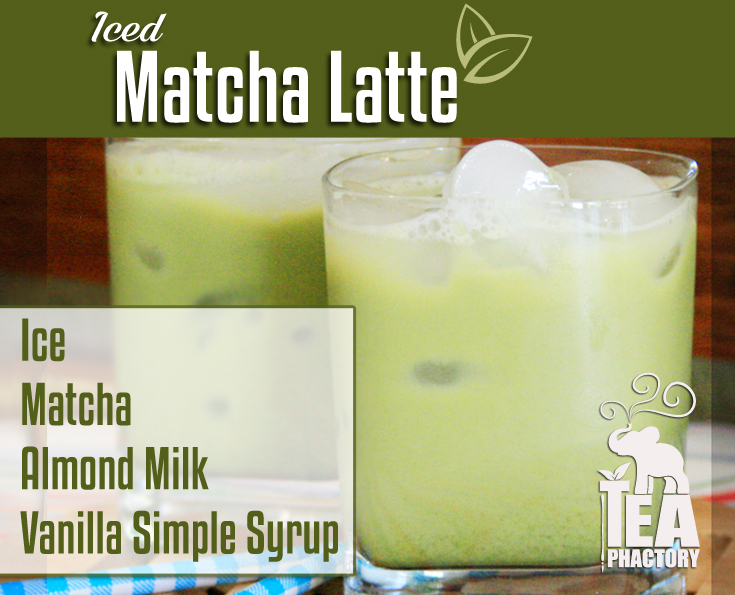 There is however one iced tea drink that never goes out of season, the iced matcha latte. It’s perfect spring, summer, and fall. You’re probably familiar with this little gem, available at your favorite coffee house. Did you know it’s super easy to make at home? So why are you standing in long lines and paying a ridiculous price? A regular size can run about $4, want a bigger one and it’s close to $5. You can make it yourself, avoid the hassle and crowds of the coffee house, all for around 90 cents. Our delicious recipe is not only low cost, but also low calorie. Not to mention it’s organic as well as gluten and dairy free. Sift 2 tsps matcha powder into a matcha bowl. Heat fresh cold water to a boil and let cool to 175°F (about 2-3 minutes). Whisk 4 tbs water into the matcha powder until a fine foam forms on the surface. Combine matcha, vanilla syrup, and almond milk in a mason jar with a lid. Shake vigorously. Pour over ice. If you’re in a hurry, and not worried about the perfect smoothness of the matcha, just put all the ingredients in the jar and shake before pouring over ice. You’ll be glad you learned how to make this one yourself. It’s healthy and delicious enough to be an everyday treat especially when it doesn’t break the bank. Important event, special guests, or perhaps a significant milestone, sometimes a cocktail simply must impress. Or, let’s face it, for some occasions a run of the mill drink just won’t do. That’s where the TeaPhactory Matcha Zentini is sure to make an impression. Matcha, a finely ground powder of specially grown and processed green tea leaves, is the star of a centuries-old Japanese tea ceremony and the headliner of this impressive drink. To craft this cocktail in a manner as entertaining as it is exceptional, prepare it using the traditional tools. As you whisk this magical powdered elixir into a froth, your guests should be sufficiently stirred. Delight in its vibrant green color and inhale its fresh vegetal smell before adding it to the cocktail shaker. Serve this striking cocktail before an elegant meal to elevate your evening. This darling of the tea world will be a certain celebrity. Sift 2 tsps matcha powder into a matcha bowl. Heat fresh cold water to a boil and let cool to 175°F (about 2-3 minutes). Whisk 1 cup water into the matcha powder until a fine foam forms on the surface. Add Meyer Lemon simple syrup, whisk until combined. Fill a cocktail shaker with ice, add vodka and matcha mixture. Shake to combine. Strain your cocktail into a martini glass rimmed with matcha sugar. For the rimmer, combine 1/2 tsp matcha powder and turbinado sugar on a shallow plate. To rim the glass, dampen edge of martini glass with Meyer Lemon simple syrup and dip in the matcha sugar mixture. Temperatures are hitting their zenith, calling for the ultimate summer refresher, and sangria is simply perfectly suited. But wait, it’s still swimsuit season, all that wine and juice and soda really rack up the calories. What if there was some way to enjoy the perfect hot weather libation without all the added sugar and calories? Here comes the other ultimate summer beverage to the rescue. Iced tea saves the day. Tea Phactory’s Tropical Breeze Slim Sangria combines the benefits of healthy, zero-calorie, green tea with the magic of sangria. This recipe delivers about half the sugar and calories of a traditional sangria without the artificial sweeteners and chemical craziness of diet soda. Our Tropical Breeze tea is a Chinese Sencha, a green tea with slender leaves that gives a natural, lightly-sweet flavor. The green tea leaves are combined with pineapple pieces and blue malva flowers for a delightful brew. Paired with pineapple wine, pineapple juice, and fresh fruit, it’s an enchanting alternative to heavier sangrias. Choose a coconut rum if you prefer a more pinacolada type flavor or go with spiced rum if coconut isn’t your thing. Brew 3 Tbs. of Tea Phactory Tropical Breeze loose leaf tea in 1 liter of water, chill. Combine chilled tea, pineapple wine, pineapple juice, rum, and sliced lime, lemon, and orange in a large pitcher, reserve some fruit for garnish. 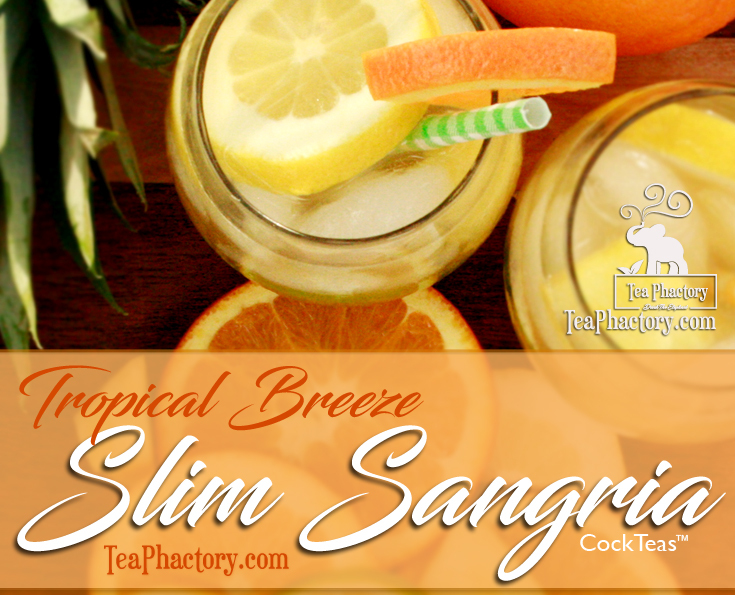 Refrigerate Tropical Breeze Slim Sangria for 2-4 hours. Stir before serving, pour over ice, garnish with fruit. If you’re anything like me, when the temperature spikes cloyingly sweet drinks become intolerable. In addition to being lower calorie, Tropical Breeze Sangria is also less sweet. It strikes the ultimate balance. Enjoy this refresher poolside or with a seasonal brunch or picnic. It’s the perfect summertime sipper. Sometimes it’s just too hot to put on the tea kettle, which probably means iced tea is needed more than ever. Good thing there’s a perfect solution – cold brew. In addition to beating the heat, the cold brew method can produce superior results reducing both dilution and bitterness. The result is a sweet, smooth tea with increased clarity. By not exposing tea leaves to hot water, fewer catechins and tannins are steeped out. The benefit is a less astringent brew which allows more delicate and elusive flavors to shine. However, the same holds true for caffeine, so keep that in mind if iced tea is a go to pick-me-up or an evening elixir. Cold brewing works with most every type of loose leaf tea including green, white, black, and oolong. It’s a fantastic way to breathe new life into old favorites. The subtle to dramatic shifts in flavor achieved by cold brewing is worth the wait. Since the method can take up to eight hours it’s essential to plan ahead. Other than the time spent waiting, cold brew is one of the simplest methods. Just place cold water and tea leaves in a vessel, refrigerate, wait, and strain. However, it doesn’t hurt to know the details. Measure 2 tablespoons of loose leaf tea in a vessel. Add 48 ounces of cold, clean water. Place in the refrigerator and steep for at least 8 hours, or overnight. Strain and add sweetener if desired. Serve over ice or drink it cold, straight from the fridge without any ice to dilute the flavor. Use double the amount of loose leaf tea used for brewing hot tea. Use fresh, cold water. The quality of water will affect the taste of the tea. Be sure to strain the leaf from the tea once steeping is complete. Now that basics are covered, experimentation is key to developing unique and delicious cold brews. Again, since the chances of bitterness and clouding are significantly reduced, it’s hard to go wrong. Feel free to increase the amount of tea, don’t be afraid to use more leaf, or vary the steeping time. Already cold brewed a tried and true favorite? Try something new. This method is particularly suited to delicate white teas like White Peony or Snow Buds. The mild flavors of these refined and understated teas are truly enhanced by cold brewing. For those who like sweet teas try our Tropical Breeze or Black Currant. Keep in mind this method brings out more of the tea’s natural sweetness, so sample the batch before adding additional sweetener. If needed, try honey or agave, both dissolve more easily in cold liquids. Already have a pitcher of cold brew that’s not quite ready? Need tea now? 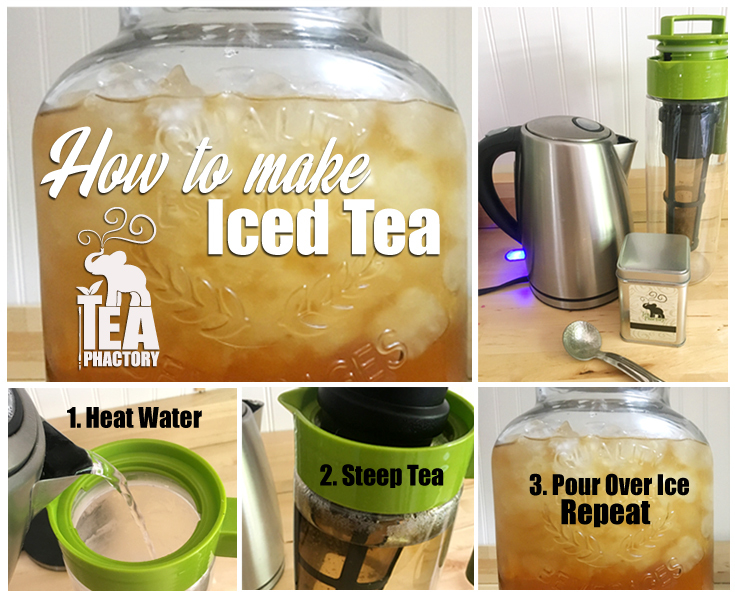 Try this alternative hot brewing method for flavorful iced tea. We’ve all had the super sweet iced teas offered in restaurants or minute markets and they make our stomachs sour or our blood sugar spike from too much sugar. In many cases, there is just as much sugar or artificial sweetener in bottled tea as there is in soda. In the end, let’s be honest, these iced teas don’t really taste very good. 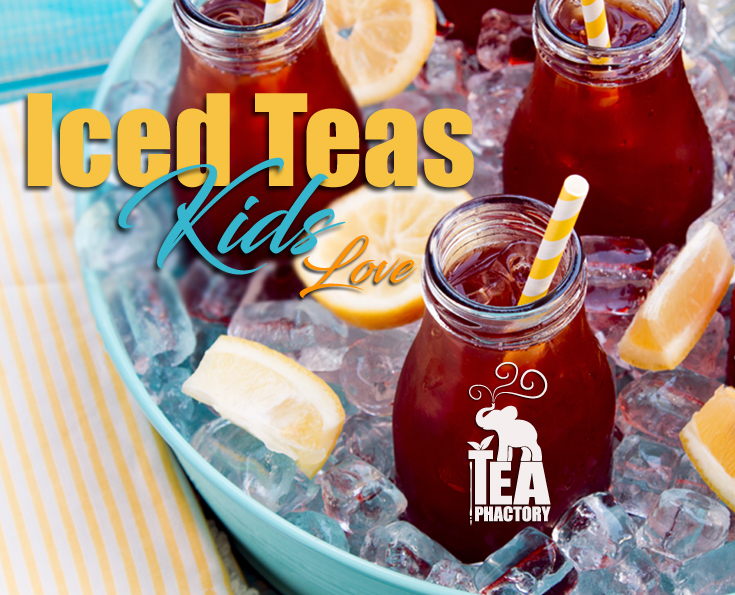 So how do you make a great iced tea that’s not only healthier for you and your family, but also one that everybody will love? Quality loose leaf tea. Start with a high quality loose leaf tea. Quality is essential but when a glass of iced tea made from loose leaf can be as little as $0.20, it seems too good to be true. 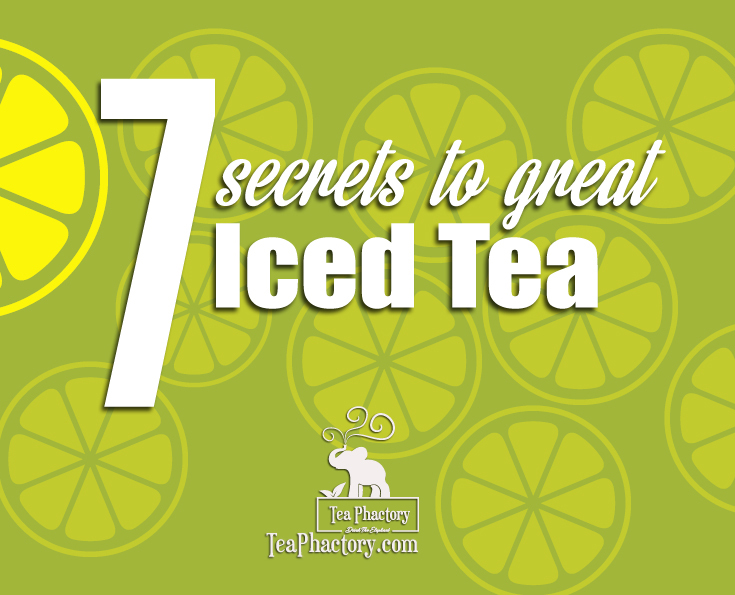 You can make 2 gallons of iced tea for as little as $2 vs. $3 or more for a 12 ounce bottle. Essentially, a 12 ounce glass of fresh iced tea can cost you as little as $0.20. Value. Superior loose teas can be steeped more than once, giving you more bang for your buck in comparison to bagged teas. With bagged teas you can easily go through an entire box just to make enough tea for yourself or a small group. Purity. Loose teas typically are whole leaf and infuse more flavor and health benefits into your iced teas. Most bottled iced teas are made from instant powders with little to no health benefit. Add on that bottled teas are loaded with sugar and artificial flavoring. If you’re looking for a healthy alternative, loose leaf teas are a great option with many naturally sweet teas to chose from. Variety. There are thousands of flavors of pure loose leaf tea and tea blends so you’re bound to discover a favorite. Loose teas offer everything from minty to fruity flavors; pure teas like black, green and white teas; blends with different herbs and spices; and so much more. If you’re not sure where to start, I have a few recommendations below. Flavor control. With loose leaf teas you can determine the strength of flavor by simply measuring out more or less tea to be steeped. Begin with the amount of tea recommended on the brewing guide and make adjustments from there. 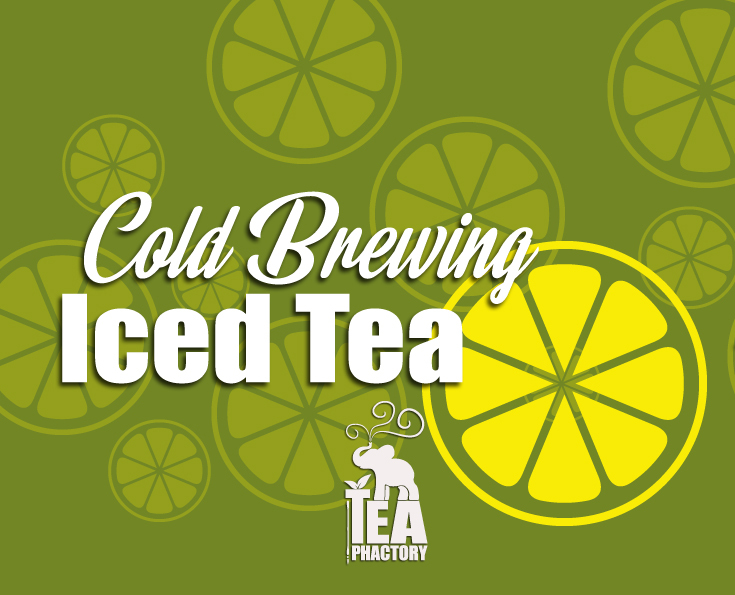 For iced teas you want to brew them strong so the ice doesn’t dilute the flavor too much. I start with doubling the measured amount recommended for brewing the hot tea. Water. Water quality can have an impact on how your iced teas turn out. Especially in large cities where water is put through purification processes and can impart a chemical taste to your iced teas. To improve your water quality and the flavor of your iced teas, use a filtration or purification system to remove the chemical taste. Time. Steeping times are an important aspect of brewing tea. It is a common misconception that steeping tea leaf for longer periods of time will make the tea stronger in flavor. In reality, this actually makes the tea bitter in taste. Follow the brewing guide recommended by your tea supplier regarding steeping times. Pure Leaf Teas: Traditional iced teas are made with pure leaf teas like black, green, or oolong. Black Tea – The traditional iced tea, tea. For making iced tea you want a strong flavored black tea blend. China Black Tea, English breakfast, or Irish breakfast. Fruit Teas: If you’re looking for something that is naturally sweet, a loose leaf tea blended with real fruit pieces make delicious iced teas. 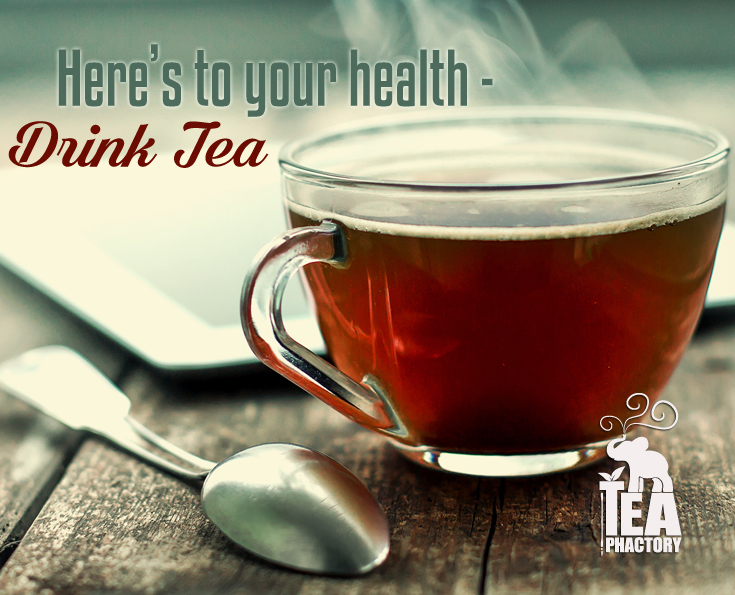 There are a number of herbal blends that make great iced teas and all are caffeine free. Rag Time Root Beer – If you’re looking for something a little different, brew this tea extra strong, pour over ice and you will have a guilt-free pleasure. Summer time is tea time and what better way to kick off the season than by brewing up your favorite iced tea? It’s easy, here’s how. Start by choosing the perfect tea. While black teas are most commonly used for iced tea, almost any type of loose leaf tea or herbal blend can be chilled and made into a refreshing iced tea. Heat the water to just a boil and pour the hot water into your steeping vessel. Measure out the tea and add it to the pitcher of hot water. You want to double the amount of tea you would use for hot tea when making iced tea. Allow the tea to steep for 2-3 minutes and strain. Once you’ve got that delicious beverage in hand find a cool, shady spot and enjoy the summer months.